With Thursday, July 19 (aka #GetToKnowYourCustomersDay) just around the bend, we thought it would be the perfect opportunity to reflect on what our customers are saying about us! Our customer Chelsea left us the review below on Yelp. Seeing how much she appreciates Fruitealicious (and bubble tea in general) brought some bigs smiles to our face. You may not know this yet so we appreciate Chelsea reminding everyone that we are on UberEats! Hopping on UberEats is the perfect solutions for days when you’re just not willing to leave the comfort of your cozy home. Although Chelsea hasn’t tried it yet, we can assure you that the Purple Orea is as good as it looks, if not better! "The way I evaluate the quality of a bubble tea shop is by always ordering the staple classic milk tea. At Fruitealicious, located inside the 99 Ranch grocery store, you get your choice of 25-100% sweetness. I chose 50% and that was the perfect level of sweetness. And the milk tea was tasty. Bubbles were perfect balance of chewy and flavorful, without being too much of either. So, they knocked it out of the ballpark! The menu selection is quite robust so I may come back to try some other drinks like the purple Oreo shake. This store is also connected to UberEats in case you wanted to have your drinks delivered! I am sad I did not discover this establishment sooner than I did. I will definitely be back." Jonlin, another happy customer, left us an equally humbling review! 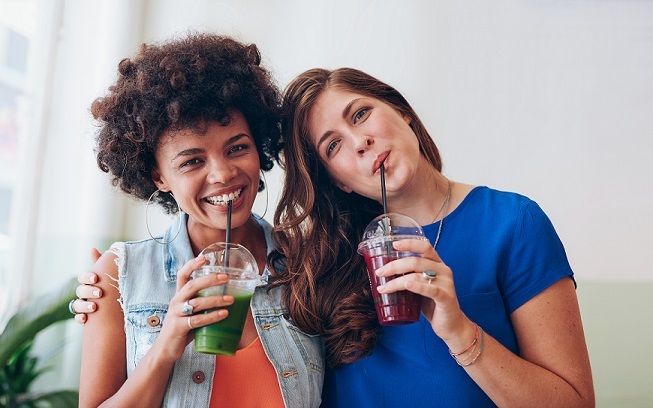 It looks like everyone is loving our new location opened in partnership with 99 Ranch Grocery.Our six locations make it easier than ever to pick up bubble tea across the Dallas, Forth Worth and Austin areas. With America’s birthday just around the bend, your celebratory plans are likely taking shape. 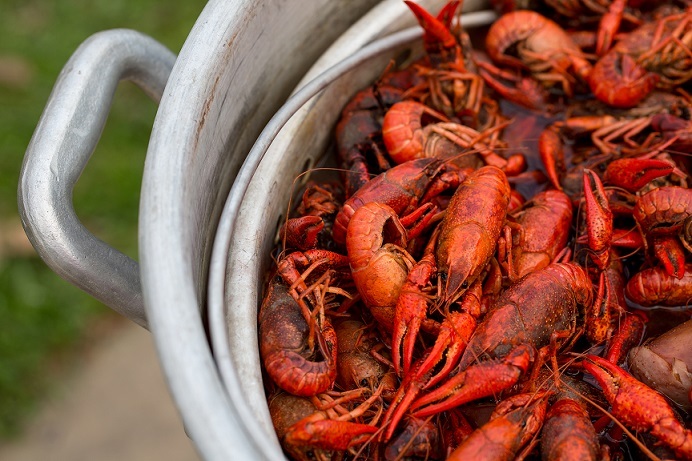 Since all of our Fruitealicious locations are based in Texas, we thought we’d round up a few awesome places to celebrate locally. To enjoy what’s been rated one of the absolute best firework shows nation-wide year after year, head to Addison Circle Park for Addison KaboomTown. Held on July 3, the celebration promises tons of fun for the whole family all day long. Think plenty of games, face painting and food vendors. There’ll even be a carnival! If you’re looking for something a tad less crowded. Try Red White and Boom on the Bridge. Held on the Ronald Kirk Bridge, the celebrating starts at 6 p.m. with food trucks and live music. There’s a reason the Austin Symphony July 4th Concert & Fireworks celebration is the biggest in the city, it’s amazing! A memorable and moving patriotic performance by the Austin Symphony Orchestra is the perfect introduction for the show at 9:30 p.m. The show is so big that you can find yourself an awesome spot near Lady Bird Lake or Zilker Metropolitan Park and enjoy the fireworks from afar. Whether you’re celebrating at home or packing a picnic to bring to watch the fireworks, don’t forget to pack some bubble tea. Stop in at any of our locations and to snag bubble tea to keep your friends and family refreshed and hydrated through the duration of your celebrating. We also highly recommend you include some of your own fireworks on your packing list, a big blanket to spread out on and some snacks to munch on for the night ahead. Some bug spray won’t hurt, either! It’s worth noting that the Addison KaboomTown celebration doesn’t allow oversized chairs so blankets really are a safe bet! 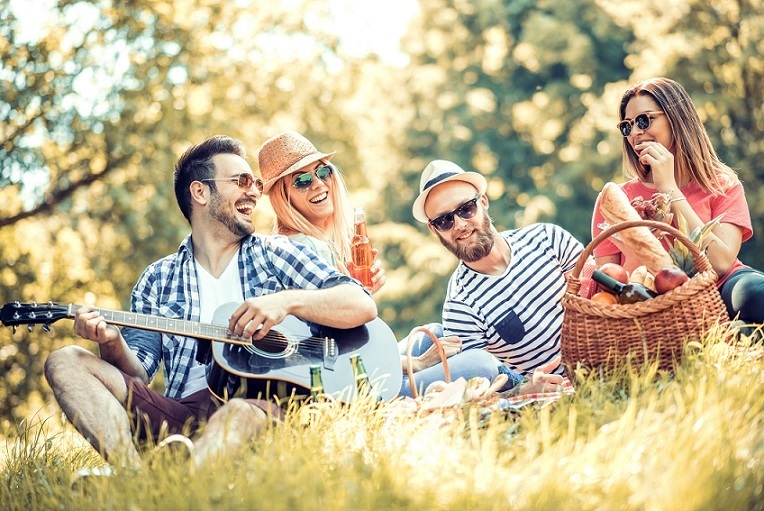 As the heat of the Texan summer rays beat down on us all, we rounded up some of our favorite Fruitealicious-friendly activities. We might be new to the Austin area but boy have we heard a lot about the Barton Springs Pool. Fed by underground springs, the Springs are an ideal way to while away a summer day. Sipping on a Fruitealicious beverage while perching at the edge of the springs sounds pretty incredible to us. Might we also recommend hiking to the top of Mount Bonnell, kayaking on Lady Bird Lake and exploring the Barton Creek Greenbelt? Taking a walk around Klyde Warren Park is not only a fun way to spend an afternoon, but it’s a healthy outdoor activity. Bring the dog and check out this vibrant green space in Dallas. Another fun option is to pack up your fishing gear and tackle and head over to White Rock Lake. For the creatively inclined, visit the Arts District in downtown Dallas. Spanning 19 blocks, a stroll through the district provides an unparalleled opportunity to explore a wide variety of masterpieces. Don’t forget that we have two Fruitealicious locations in Carrolton, Texas! We are not ones to limit our customers creativity, so we highly recommend coming up with your own Fruitealicious-approved summer happening! We can happily vouch for how perfect a Fruitealicious beverage is at a BBQ, pool party or a picnic at the park. Regardless of where your adventures take you this summer, a Fruitealicious beverage in hand is highly encourages so don’t forget to pop by one our stores. Pick up a refreshing bubble tea on your way to check any of these out! Our beverages make for the perfect pairing for just about any summer activity. You can find the full list of our locations here. Swap out sweet tea for a drink that’s equally refreshing, thirst-quenching and flavor-packed. 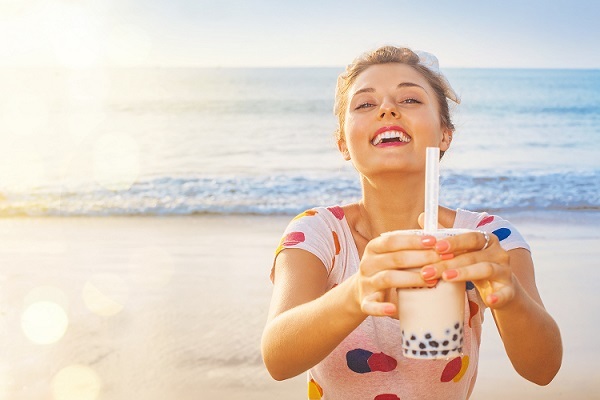 Our favorite Taiwanese beverage, bubble tea is the perfect drink to beat the brutal summer heat of Texas. Not only is bubble tea itself majorly refreshing, but all of the ingredients we use are as fresh as possible! Even our tapioca balls are made in-house in small batches to ensure consistency in both taste and quality. Served up with an extra-wide straw, our bubble teas should be consumed quickly to retain their freshness. Topping our recommendation list is our Aloe-Ha refresher which is infused with fresh strawberries and freshly diced aloe vera. One of the many incredible aspects of bubble tea is how customizable it is! With a wide variety of refreshing concoctions available, we have plenty of bases and toppings to choose from. Whether you prefer a classic tea base, a tart lemonade base or an energy-jolting coffee base, we’ve got just the thing for you. 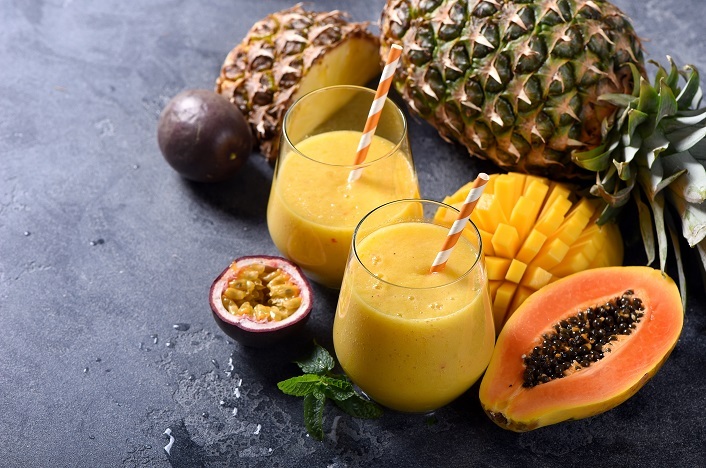 A long list of mixers such as fruit, pops and boba provides plenty of opportunities to tweak your beverage to your taste preferences and express your individuality. You can sip on fruit-infused water or iced coffee any day of the week. Why not try something new and sip on bubble tea instead? While it’s not new to the beverage scene, we still have plenty of first-time customers who have never tried bubble tea before. Switch up your hydration habits and try the best bubble tea in Texas instead. With our six locations across Texas, it’s never been easier to pop into Fruitealicious for a refreshing bubble tea. Remember, we’re open seven days a week year-round and are here to help you navigate the unrelenting heat this summer will bring! Whether you’re trying bubble tea for the first time or you’ve been slurping tapioca balls from your favorite class milk tea for ages, we’re confident you don’t know all there is to know about bubble tea. We thought we’d share four fun bubble tea-related facts for the benefit of the novice and advanced bubble tea aficionado alike. Trying something new can be overwhelming, especially when just about everything on the menu looks like something you’d enjoy. If you’re looking to try a classic and ever-popular bubble tea, trying a classic milk tea is a great place to start. It is the most traditional form of the popular beverage that so many in states have grown to know and love. The perfection combination between sugar, milk powder and black tea, no two classic milk teas taste exactly the same. There are hundreds of thousands of bubble tea combinations out there, we come up with original combinations regularly! One of the things that differentiates bubble teas most, however, are the toppings. Tapioca is one of the most common toppings but fresh fruit, jellies and popping boba are common, too! Especially when making the tapioca balls, using high quality is essential to a quality bubble tea drink. It helps that here at Fruitealicious we make our tapioca fresh and in small batches each and every day. That’s right, we might be biased but be stand by it! Offering our delicious bubble tea in six different locations across Texas, it’s more convenient than ever to scoop up some bubble tea to sip on. With the summer heat quickly approaching, we highly recommend you figure out which location is most convenient for you to visit, and fast! Is it too early to start thinking about summer? We think not here at Fruitealicious! While we serve up tons of tropically-inspired smoothies and slushies year-round, we’re especially excited to serve them as the heat of summer approaches. Think cold, refreshing mixes featuring mango, coconut, pineapple, passionfruit and strawberry. Our dedication to using only the freshest ingredients ensures that you’ll appreciate each delicious blend. Mango and passionfruit, a delicious and dynamic duo in any tropically-inspired beverage! As one of the most popular fruits in the world, mango has long been a staple in beverages and dishes alike. Papaya, grown throughout Central and South America rounds out the sweet taste of the mango. We’re also incorporating mango into a few other delicious combinations like green apple mango, mango pineapple, kiwi mango and peach mango. Nothing is quite as synonymous with the tropics as a pina colada. The perfect marriage between coconut and pineapple, it’s a refreshing option to welcome in the summer months ahead. Coconut is electrolyte-packed, making it a hydration power fruit! Exotic and nutrient dense, the lychee fruit comes from tropical areas of China. Packed with health and medicinal benefits, our sweet tasting lychee strawberry blend is the perfect ode to tropical days ahead. Have a tropical combo you don’t see on our menu? Dream it up and our team will whip it up! We take customer creativity very seriously around here and encourage you all to think outside of the box whenever possible. Are you following Fruitealicious on instagram @fruitealicious? If not, you could be missing out on some pretty awesome discounts and free upgrades. Our specials don’t just apply to our tropical selections but all of our menu items! Be sure to tag us in your photos, we love seeing that our customers love Fruitealicious as much as we do. Have we mentioned lately how much we appreciate our fans? Our Austin location opened back on March 3rd and the response from you all has has been overwhelming. In the over two weeks since our opening, lines at Fruitealicious continue to be out the door! Thinking back to the opening of our very first store nine years ago,your support is truly humbling. To all those that visited us on our very first day and the many that continue to come back, thank you! We could not do any of this without your support. From day one, our goal has always been to make our customers happy. We can proudly state that we accomplish that goal every day across all of our six locations, evident in the wide smiles of the customers that walk through our doors. It is apparent through your support that you love us as much as we love you! Pictured below are Carmen (owner) and Brandon happily working away at Fruitealicious. With growth come some minor growing pains. As we work through smoothing out some processes at our new store in what we consider to be our soft opening phase, quality drinks and stellar customer service remain at the core of everything we do. In this exciting growth phase, we’re looking to add some talented staff members to our team. We take staff happiness and development very seriously around here and are looking for positive, hard-working individuals to grow with us. If you’re on the lookout for the opportunity for an exciting career, we would love to have you apply! If you haven’t been by to see our Austin location yet, what are you waiting for? We’re located in the Crescent at 6929 Airport Blvd, Ste #110, Austin, Texas 78752. The Fruitealicious team is thrilled to announce that we have officially opened our sixth location in Austin, Texas! We are thrilled to be opening this location in partnership with 99 Ranch Grocery, a California-based grocery store chain carrying specialty products from Asia. Fruitealicious has been redefining refreshment in Texas for ten years and we are so excited to bring our concept to a new city. On ice, frozen and tea-based are just a few Fruitealicious offerings. We have literally thousands of variations including milk-based beverages, coffee, lemonades, chillers and smoothies. With tons of flavor and mixer options, there are so many combinations to concoct! Our menu even features health and wellness mixers like protein, B12 energy, wheatgrass and chia seeds. If you’re in the mood for something fruity, we highly recommend you try the El Diablo. Mango-centered, the El Diablo is the perfect marriage between spicy, sweet, sour and salty flavors. Have a mean hankering for a chocolate delicacy? Our Chocolate Covered Strawberries blend uses fresh strawberries and decadent dutch chocolate. If you’re looking to work for a company with a culture driven by teamwork, collaboration and a positive environment, you’ve come to the right place! Visit the careers section of our website to learn more about what working at Fruitealicious is like. The scores of employee testimonials will speak for themselves! We’re looking to hire top talent for our newly opened Austin store. Are you based somewhere else in Texas? We have stores in Carrollton, Frisco and Fort Worth, too. Reach out to us to discover opportunities at our other locations. Stop by and see us! Our Austin location is in the Crescent with an address of 6929 Airport Blvd, Ste #110, Austin, Texas 78752. On some days, you wake up to your alarm on the first ring and jump right out of bed. You kick off the morning ready to take command of your day and power through a long to-do list. On other days, not so much. You might be dragging a little bit and procrastinating on starting your day. An energizing tea combination from Fruitealicious might be just what you need to get some needed pep in your step! With a green tea base, our Jasmine Tootea Fruitea is a flavor-packed beverage you’re sure to love. Shaken with jasmine and honey, it has a sweet scent and is infused with our seasonal, fresh fruit bits. It’s doubly beneficial as green tea has high levels of antioxidants, helping to strengthen your immune system. What is the tri-fecta, you ask? Boba, flan and grass jelly, a Fruitealicious specialty! Our black sugar tri-fecta is a Taiwanese specialty that is a featured item on our menu. Served on ice, we blend hot milk tea with melted black sugar for soft and sweet notes. The tri-fecta adds unique taste and texture to this beloved, refreshing drink! If you’re feeling creative, you can always mix up your own tea concoction. Simply pick either black tea or green tea as your base, choose a flavor such as lychee, guava or kiwi, to name a few, and add in some mixers! If you really want to max-out your tea you can even add some B-12 energy. B-12 energy is one of many mixer options we have at Fruitealicious. Still unsure of what tea combinations to try? Two of our favorite energizing tea recommendations are mango black tea and raspberry green tea. For all of our on-the-go fans, we have a ton of energizing tea combos to try. The next time your day is needing a boost, stop by any one of our Fruitealicious locations in Texas. Every single drink we make for our customers is custom and made-to-order. While we have an extensive menu of combinations we’ve concocted, we always encourage our fans to get creative! With over 10,000 possible combinations that can be modified to create your idea of the perfect boba treat. As if all of those options weren’t enough, remember that you can make your boba tea hot, cold or frozen. We started out with a single location in Carrollton and have since grown to 5 (soon to be 6) locations in Texas without outside investment! How did we do it? By staying committed to our fans, team members and core values. Check back soon as we’ll be announcing the opening of our newest location in Austin. Quality is a top priority here at Fruitealicious. We invest a lot of time in sourcing fresh ingredients and high-quality boba to ensure an end product that we’re proud of. Many of our suppliers are based in Taiwan and ship our product straight to us, where we make tapioca in small, fresh batches throughout the day. Yes, you read that correctly! Sometimes the ideas we cook up in our heads don’t translate how we envisioned in real life, that applies to boba team experimenting. If you don’t like your drink, let us know. One of our awesome team members will whip you up a new drink that you’re sure to love. One least reason to become an avid Fruitealicious fan is because we love our fans! We regularly run specials to show you all that. Come into any one of our stores on #fruitealiciousfansfriday and show that you follow us on social media for a free large upgrade! Be sure to follow us as we regularly announce other specials and updates on social media. Many of our biggest fans also happen to be huge coffee lovers! Did you know we serve up delicious iced and frozen coffee-flavored creations at Fruitealicious? No matter how you choose to customize your beverage, we can promise that one of our coffee-based drinks will give you a much-needed jolt of flavorful java. A refreshing alternative to a piping hot cup of coffee, an iced or frozen coffee from Fruitealicious is the perfect companion on your morning commute. First thing’s first, you’ll need to tell our team member whether you prefer your beverage iced or frozen. You can’t go wrong, both the iced and frozen versions are equally refreshing in the Texas heat we all know and love. With a range of five flavors to choose from, there is no shortage of options to customize your drink exactly the way you want it. You can choose mocha, hazelnut, vanilla, caramel or caramel macchiato as your flavor base to build upon. Yes, you read that correctly, there are literally thousands of combinations you can choose from to imagine a completely new drink. This will not be your average coffee drinking experience. We have different types of jellies, boba and fruit for you to choose from. 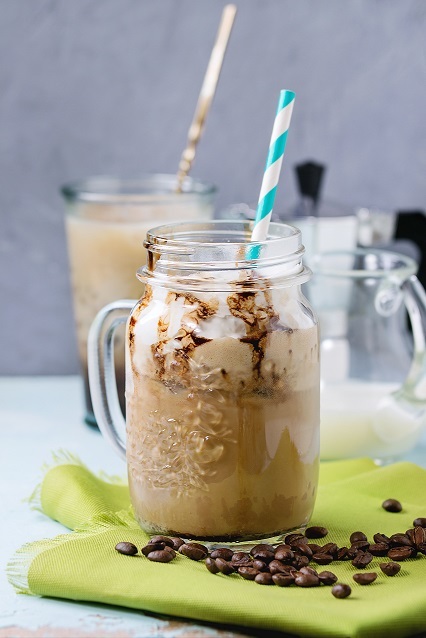 Tapioca, flan pudding and strawberries are just a few of our favorite mixers to take your next iced or frozen coffee to the next level. Is health and wellness a priority for you in the New Year? You can have your beverage made with almond or soy milk. We’re inviting coffee enthusiasts far and wide to come visit us at any of our five (soon to be six!) locations for a unique twist on your favorite drink. Calling all talent! You could be our next star. Fruitealicious star, that is! As you may already know, we’re turning the corner on opening our newest Fruitealicious location in Austin, Texas. We’re bringing the same strong company culture, incredible menu and core values that have helped us succeed at our other five locations. As we put the finishing touches on our brand new space, we anticipate an opening date of late January, early February. The final, and most important, piece of the puzzle is recruiting a fantastic team! If you have an interest in working in a fun environment with hard-working, dedicated team members, a job at Fruitealicious might be just what you’re looking for. Beyond teaching you how to make unique, delicious bubble tea beverages, our employees also learn lifelong skills such as work ethic and teamwork. We’re not just tooting our own horn! Our employee testimonials speak for themselves. Built on a foundation of peace, our goal is to empower each of our employees and live our core values of persistence, effort, attitude, communication and empathy every day. Creativity is a big part of what we do on the daily. Whether their concocting new drinks from thousands of possible drink combinations or helping pick out music at one of our stores, team members are encouraged to flex their creative muscles! Here at Fruitealicious, we strive to offer our customers an incredible product and top-notch service in a fun and supportive environment. If all of this sounds right up your alley, we’d love to hear from you! Don’t have prior work experience? Don’t let that stop you. We’ve been there before, too. As long as you’re a go-getter who believes in our core values, we want to learn more about you. Ready to get things kicked off? Fill out an online application today. Fortunately for us, our corner of the country tends to see some pretty mild temperatures in the winter, allowing us to enjoy frozen treats from Fruitealicious all year round! We’ve rounded up five favorite frozen features from our menu for you to try! Not for the faint of heart, this spicy frozen treat packs a bit of a punch! This delicious collaboration of sweet and spicy is tropically-inspired and mango based. A roller-coaster of taste, the El Diablo will take you on a ride featuring a little bit of everything, sweet, salty, and spicy! Chocolate covered strawberries is a combination of dutch chocolate and sweet strawberries, need we say more? If you’re looking for the ultimate chocolatey indulgence, this is most definitely the right choice for you! The Spotted Cow combines two of our favorite things, smooth caramel and sweet tapioca! Topped with flan pudding, this frozen treat is doused in rich caramel. Tapioca pearls add even more texture to this creamy blend. Don’t let it’s vibrant color scare you away. Purple Oreo is the perfect marriage between Taro and a favorite chocolate cookies, oreos! Creamy and sweet, Taro is made from a root that tastes a lot like vanilla, offering just the right amount of creamy taste to this blend. No stranger to a timeless classic, we really enjoy this satisfying frozen creation. A berry-packed treat, Strawberry Shortcake is the perfect mix of strawberries and whip cream! Warning: this may bring back memories of long summer days spent baking in the Texas sun. If you’re still reading and haven’t already jumped in the car to drive over for one of these, we applaud you. Don’t you worry, each of our five (soon to be six!) locations is open seven days a week! Stop in today to try one of these five tasty frozen treats. Fulfilling our mission of empowering people to live their lives to the fullest would not be possible without staying true to our five core values! Our values of persistence, effort, attitude, communication, and empathy serve as the guiding star for all that we do at Fruitealicious. Especially when working to overcome adversity, we truly believe that persistence is a key ingredient! Regardless of how difficult a feat may seem, we recognize the power of getting up and persisting time and time again to succeed. We’re sure that you’ve heard the saying, “you get out what you put in.” A commitment to putting forth maximum effort at all times is essential to our company culture. Our team members come to work every day and put their best foot forward to get the job done! We believe that a positive attitude goes a long way, not just at work but in our personal sphere of influence. That’s why when you walk into any one of our Fruitealicious locations; you’ll be greeted by one of our smiling, helpful team members. We hope that our positive attitude and good vibes will stay with you long after you’ve slurped up your boba tea. There’s no arguing the importance of communication in establishing positive and productive relationships with others. We’ve found this to be true in the foodservice industry as well! You’ll notice that many Fruitealicious team members are young, that hiring move was intentional! We were all young once too looking for our first job so when we started this business we knew we wanted to give young people opportunities. Beyond wanting to help them thrive in their first job, we want them to gain life skills along the way! Acting with empathy is just one of the five values we instill in our employees. Fruitealicious would not be the extraordinary company that it is without the support of our incredible customers and hardworking staff! We are thrilled to serve communities that support the core values we espouse. Peace, Love, Boba: it’s in our mission, after all! Stop in and visit us at one of our many locations to see our mission and values at work. During the spookiest month of the year, milk tea is known to keep the ghouls, goblins and ghosts away! All jokes aside, a creamy milk tea is appropriate any time of the year. Be sure to stop in and try any of our delicious iced milk teas. In our humble opinion, you can never go wrong when ordering a classic milk bubble tea. With a strong flavor of tea, this traditional option is very creamy and rich in taste. If you can’t choose between all of the delicious milk tea options we have at Fruitealicious, the Classic is a great place to start! Almond milk tea is a great option for vegetarians and vegans alike as it is dairy-free. With a slightly nutty twist, this milk tea option won’t disappoint! We highly recommend topping your almond milk tea with some chia seeds which will add an energy boost and contain protein and fiber. Looking for a tropical take on your milk tea? Try the coconut milk tea and let your imagination take you back to memories of your summer beach trip. Adding mango and pineapple jellies is highly encouraged! Made from taro root, taro milk tea makes for a thick, creamy concoction. Described as sweet and creamy, taro has a unique flavor but is said to taste like vanilla by some people. Don’t hesitate to add some tapioca to your taro tea to give this thick treat some added texture. It seems like matcha is all the rage lately. It’s antioxidant and detoxifying properties offer up two health-related reasons to order the matcha milk tea! Don’t let it’s vivid green color scare you away, matcha milk tea is another tasty option on our menu. Whatever halloween-related frights you face this month, a yummy milk tea will bring you plenty of comfort whether you’re kicking back at home or donning your goofiest costume bopping around town. 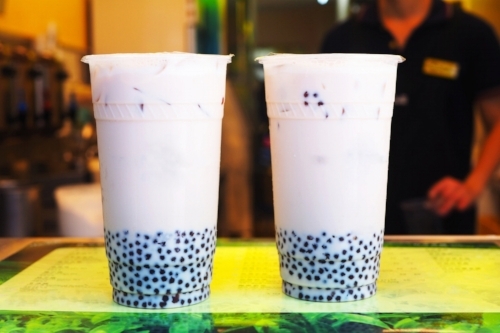 If you’ve ever had bubble tea, you probably think of tapioca as those delicious, chewy balls found in your glass. No? Perhaps you’ve enjoyed the small pearls in tapioca pudding. Regardless, you may still be left wondering, what exactly is tapioca? Tapioca is actually a starch that is extracted from the cassava root, known in some parts of the world as yuca. The root is mainly grown in tropical and subtropical areas throughout Asia, South America and Africa. Originally produced in Northern brazil, most tapioca production now comes from Brazil, Thailand and Nigeria. In many parts of the world, yuca is a staple food source. After being harvested, toxins are removed from the cassava root before the starch is processed. The starch is what we’re interested in because it is formed into the ball-shaped pearls we put in bubble tea! Pearls, however, are only one form that tapioca comes in. It can also be formed into powder, sticks or flakes. We’ve already discussed two uses for tapioca, tapioca pudding and bubble tea. Tapioca is also known to be a very effective thickening and can be used to thicken soups. This should come as no surprise but our favorite use for tapioca is using pearls in our bubble tea, of course! Here at Fruitealicious, we believe that fresh ingredients are key to creating a tea that is both refreshing and delicious. You’ll find that we cook our tapioca in small batches throughout the day to ensure that they are fresh for our customers at all times. What do tapioca balls taste like? In our opinion, they taste like caramel! That flavor has a lot to do with them being infused with brown sugar. 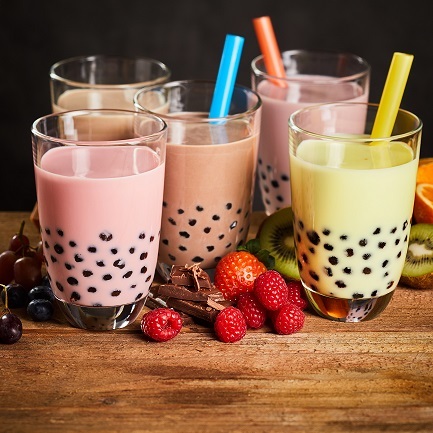 Whether you have yet to try tapioca or you’re a tapioca connoisseur, we look forward to treating you to some of our bubble tea. Find us at any one of our five locations and look for our sixth location coming soon to Austin!